I can remember a world without the internet and setting up our very first email years ago. Our first thoughts were what are we even going to do with an email account. Now it seems like kids need an email account at a very young age. 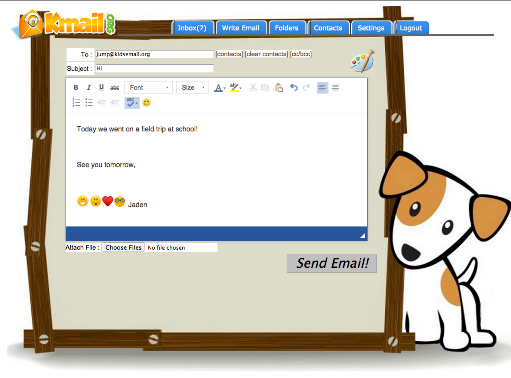 We recently started using the Annual Subscription from KidsEmail.org for Alaina's email account. Signing kids up for their own email is kind of a scary thing. I know how much junk mail I receive in mine and even with security settings someone can send them things their young minds don't need to know about. It isn't that way with KidsEmail.org. This is the place where you can set up an email account for your child or teen and not have to worry about what they receive because you have control over their account. KidsEmail offers an account for teens and for children, and I signed Alaina up for the kids email. She can log into her account and I don't have to worry about what she is going to see. When she logs in she has the option of going to her inbox, writing emails, looking at her folders or contacts, and also her settings. She is able to add people to her contacts and create new folders to help organize her emails, but the only thing she has control over in settings is changing her background. The parent account on the other hand is very different. When I log in I have several options to make her experience more secure. Safety Settings ~ In this section I can make changes for each child or set the same ones for every child in my account. I can decide if she can receive emails from anyone who is not in her contact list, allow pictures, links, bad words, or attachments to be included in the email. I can even have every email sent to my inbox if I want to monitor them all. Manage Contacts~ I have access to add contacts in her account. Modify Look & Feel ~ There are 36 backgrounds that can be chosen for the child's account or they can change this from their login. Child Account Settings~ This is basic information about the child and if they have a kids email or a teen email. Ground Child~ You can ground the child in this section for a certain day or a specific amount of time. Time Restrictions ~ Times can be set up where the child cannot use their email each day. This can be chosen for each day and will repeat each week. Blocked Senders~ If there is an email account that you do not want sending emails to your child you can add it here. Mail Queue ~In the settings you have a choice of approving or deleting each email that may be questionable. Activity Logs~ The logs kept here are from when each child logs into their account and a section for the whole family if you have multiple accounts. Alaina likes having her own email that she can use easily. She already has one email account, but it is used for her Apple ID and she actually gets a lot of junk in it, so she never looks at it. With a KidsEmail account she only gets emails that are from people we know. It is great knowing she isn't getting any emails with bad content or even just a bunch of junk that she has to weed through to find an email from her friends or her sister in Colorado. It didn't take long for Alaina to figure out how to use her account and she is loving changing her back ground and writing in different fonts. I am loving it because I know the people in her contacts aren't sending her stuff she shouldn't be reading or seeing.